How To Choose a Good Auto Glass Repair company in Toronto? People love their vehicles. Of all the parts assembled together, to fabricate a vehicle, glass is one of the most important ones. It is, however, the most fragile one too. A little hit and it gets damaged. The weather, as well, is notoriously responsible for broken windshields in North America. Snow piles up putting pressure on windshields and they get cracked. Canada, in general, has seen a tremendous rise in the percentage of car users in recent years. With more people using cars to commute, incidents of broken auto glass are increasing. But in today’s fast life you don’t get enough time, out of your busy schedule, to take it for repairing by yourself. You can hire an auto glass repair company that would repair it at your doorstep. Reliability tops the list of qualities which you should see in a company before hiring them for auto glass repairing and auto glass replacements. The company should have responsible individuals who would know the value of quality work. Fast service is well appreciated, in any industry, all over the world. You shouldn’t have to wait for a couple of days to get your car fixed. Fewer companies like National Auto Glass provide same day services to minimize your downtime. An experienced auto glass repair and replacement company has a history of dealing with a variety of insurance companies. So in most cases, your auto glass shop will get in touch with the insurance company, on your behalf, to make an insurance claim saving you from doing the hectic work. If there is no insurance coverage, the service provider should give you most competitive rates compared to the other companies in the market. A leading auto glass repair, auto glass replacement, windshield repair and windshield replacement company cares about your convenience and so its highly likely that a good auto glass shop will provide mobile auto glass services. Either you are in your office, home, or driving on the road; a mobile auto glass repair company like National Auto Glass will come to you fully equipped and get the job done. 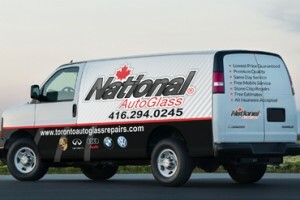 National Auto Glass is a leader in auto glass repair, auto glass replacements, windshield repair, and windshield replacements in Toronto. Our motto, Service Meets Excellence, defines our style of work. We believe in 100% customer satisfaction. Our team includes qualified auto glass repair technicians, each having more than 20 years’ experience of auto glass repairing and glass replacements. Our team services all of Greater Toronto including North York, Vaughan, Scarborough, Mississauga, Oakville, Brampton, Hamilton, Brampton, Burlington, and Newmarket. We don’t believe in compromising the quality of our work at any cost. Our workers are skilled, energetic, and are always ready to help you out. We provide a lifetime warranty on all our products and services. For questions or to book an appointment, Call National Auto Glass at 416-294-0245.